Editor’s Note: This story is taken from the upcoming print edition of Working RE, mailing soon. Am I a Subscriber? According to a recent government study, in a span of three months, 160,500 appraisals or 12,346 per week failed to pass a basic screening “review” by the GSEs (Fannie Mae/Freddie Mac). The report, issued by the Federal Housing Finance Agency, Office of Inspector General (FHFA-OIG), used data collected by the Uniform Mortgage Data Program (UMDP). According to the report, about 65 percent of the failures are attributed to the inability of the system to verify an appraiser’s license- a technical glitch in most instances, one hopes, as there can’t possibly be that many unlicensed individuals posing as appraisers! Even with this 65 percent discounted, that still leaves about 4,300 appraisals a week that failed for appraising reasons. The question appraisers need to begin asking is: how many (if any) of these appraisals are mine? The OIG reports that in 2012, the GSEs “purchased and guaranteed” approximately six million single family residential mortgages. At six million appraisals per year, that means appraisers are producing roughly 115,384 appraisals per week that are purchased directly by the GSEs. With a failure rate of 12,346 appraisals per week, roughly one in 10 appraisals are causing warning messages to be issued. Those who have a pattern of failure or instances of certain kinds of grievous failures will be blacklisted by Fannie Mae. Conversely, it follows that if you can do error-free work for your clients, you will be in the highest demand, and hopefully, able to demand the highest fees. 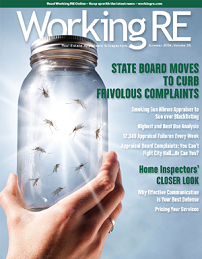 56,000 appraisals contained potential violations of appraisal underwriting requirements. Currently, there are approximately 25 different types of appraisal “failures” reported by Fannie Mae’s new AQM system (Appraiser Quality Monitoring). Not everyone is important. Many failures involve “benign” issues like formatting or missing and incomplete information. But if appraisers can’t remember to fill in information or how to use the correct format or code, what does that say about the rest of the report in the eyes of Fannie Mae and AMCs/lenders? In our experience reviewing appraisals, missing information, spelling errors, formatting problems and inaccuracies usually are indicators of more serious failures. At the very least, correcting these mistakes costs everyone time and money. 11. Failure to obtain or analyze a full copy of the purchase and sale agreement. -Fannie Mae purchased over 56,000 loans, valued at $13 billion, which may have contained potential violations of underwriting requirements. -In addition, 29,000 out of 135,000 (21%) of appraisals uploaded into the portal generated one of Freddie Mac’s proprietary warning messages alerting that either no property value could be provided or the value of the property was in question. Despite these alerts, Freddie Mac purchased all of the loans for approximately $6.7 billion. -Fannie Mae did not require lenders to explain or resolve potential problems. Prior to 2013, Fannie Mae reviewed a small fraction of the loans it purchased each year. Numerous bad appraisals slipped through the system but that has changed. Beginning now, quality means something. A failure to provide quality will mean something too – your livelihood. The GSEs are now required to analyze every single appraisal before they can allow a loan to fund. They will use the new AQM initiative and the UMDP/UAD system. That is a 100 percent “review” requirement for every appraisal. Each week many thousands of appraisals will be “hard stopped,” with fatal warnings issued, deficiencies questioned and time wasted. Missing information must be added to the appraisals and questions regarding consistency and accuracy answered. The lenders or their agents (AMCs) will contact appraisers and require changes before the loan will close. The speed at which appraisals are processed will slow down. Lenders are going to demand that appraisals are delivered sooner, so they will have more time to cure the anticipated problems before the closing date. Appraisers will be rated based on their performance- speed and accuracy. Lenders, or their agents, are going to ask for proof that the appraiser is who he says he is (prevent ID theft by unlicensed people). Appraiser certifications are going to be matched to the property type and state in which the property is located (appraisers and review appraisers). More time will spent on appraisals after they are delivered. 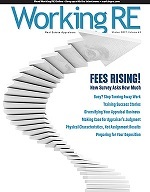 Appraisers must understand how to prepare reports that pass through the automated system. They must have a clear understanding of the rating definitions for quality and condition. They must improve the accuracy of the information contained in their appraisals and understand how to determine adjustments. They need to realize that the accuracy of the information matters, not just the value. Lenders will be required to provide a complete and fully executed copy of the purchase and sale agreement (this is vital). It won’t be good enough to just “feel” what the adjustments are or state that “in my opinion the adjustment is…” Instead, appraisers will have to determine, through evidence, what the adjustment should be. Appraisers who provide defective or inconsistent work will be blacklisted by Fannie Mae and placed on “100 percent review” list, which equals a slow death by starvation. The truth is that many appraisers need a lot of training about the issues that UAD and AQM are programmed to find. Life is changing. I’m afraid we will either have to train up or be tossed out by the AQM system. The result for the survivors will be a better product and a more competitive spot in the marketplace. Richard Hagar, SRA explains the most common appraisal pitfalls when determining adjustments and shows you how to provide the proper support, analysis and documentation for adjustments in your appraisal report and workfile. This course will help you understand and utilize quick and simple methods for proving adjustments and help you avoid problems, blacklisting and legal actions. Sign Up Now! In 2014 so far, Fannie Mae has issued numerous “updates” and changes to their AQM policies, including additional requirements with respect to its Quality and Condition Q&C ratings. In this webinar, Hagar provides a blueprint for staying on Fannie Mae’s good side by understanding how to determine Q&C ratings and adapt to Fannie’s changing requirements. Sign Up Now! I had the opportunity to work with the group that developed this new rating and review system..it is so flawed its unbelievable..and they know it! The truth is that they have allowed a few bad appraisers to shape the future of the appraisal industry and attempt to design a rating and approval system that attempts to main stream a process of solving a unique problem..the basics of which real property is unique and cannot be evaluated in the masses and be accurate …the GSEs attempt to place all real property in the same hole ..is only creating more chaos in an attempt to shift the liability away from themselves. John, FNMA looks at ratings in several fashions, between peers and by the same appraiser. Variation between peers rating a property C3 or C4 is not an issue. Rating variations that are significant between peers, where Appraiser A rates the property C2 and Appraiser B rates is C5 is what prompts additional investigation. FNMA also reviews the same appraiser rating for the same property – this rating should be consistent, otherwise it raises a question about how and why the rating changed. I don’t disagree that there are lending industry issues above and beyond the appraisal, however, appraisal reports can be improved and that is the area over which we have control. It’s interesting that you wrote a very misleading article just to try to sell your class and you want us to sign up for a class you teach to show us how to support data when you misrepresent the data at hand. Did you work for any polititions in the past? They seem to be able to manipulate data to read however they want it to. Often times, in rural America, where comps don’t exist and paired sales analyses are not possible to make and adjustment because there is an obvious, valuable difference but no support other than cost but lenders don’t want adjustments based on cost as that supposedly does not reflect “the market” when in actuality an adjustment is needed. Fannie Mae is no more intelligent than they were (about as bright as a box of hammers) but trying to create a system where everything MUST fit their mold when in so many instances it is impossible. I have been asked to remove adjustments because they could not be supported (a pole barn….a very nice pole barn) but their were “comps” to bracket it and or support it. However, in rural America a pole barn has value to the typical buyer just not other “comparable” sales with or without pole barns to actually be able to show the “market” for one. In that situation there is something to be said for using cost minus depreciation to determine “some” value that could be expected from that improvement. But without a comparable home with a comparable pole barn they don’t want any adjustment made. Show me the intelligence in that. Your article indicted that most of the errors are in the GSE/ UAD/UCDP programs that check the appraisal report for. Errors in Appraisers License, Maybe they need to correct their own programs before they start blaming the appraisers. My appraisal license have my Middle Initial however if I include that in the appraisal is comes back as incorrect. This is somewhere between the State Licensing Board and the Federal government entities that do the input. They tell us that “Condition” & “Quality” rating are ABSOLUTE however if your have 5 different appraisers rate the property for Quality & Condition I would bet that you would get some different ratings so how can they be Absolute. Also the description for Quality & Condition are subjective and open to interruption by each appraiser. If I call it a C4 and the next appraisers call it a C3, who is correct? One of could be consistently wrong. The problems in the Lending industry goes much deeper that the appraisal report. The government never make sense and they do not know how to make things simple or use common sense. They always over do or under do what is needed. It is easy for people to make poor policies that does not affect their careers or their pocket. It should be obvious to make all the tools available to make the system work for everyone. It makes good policy and good sense for appraisers to have the GSE access to review reports. What are our so called appraiser advocates doing to try and make this happen. Why did they not fight for this in the beginning? The career of appraising is not fulfilling any longer. I thank God I have other sources of income. I am working my way to do this only part time just to keep up the skills and knowledge. If your report is not 100% in the “GSE’S” designated criteria within the confines of their set parameters you as an appraiser will be in violation of their criteria. The UAD forces appraisers to put homes in “designated” boxes (quality/condition) and once made by the appraiser it’s “set in stone.” Meanwhile, back in the real world; you as an appraiser are using databases and information that is: “deemed reliable but not guaranteed.” Which also depends on Realtors who have a dog in the race to be perfectly honest on their listings (they always are right? wink wink) to include problems in the home they are trying to pawn off. I’ve run into the UAD problems with my license expiring one day before it actually expires. They are moving the goal post. There is nothing in the UAD for homes that are “tweeners.” You know Freshly painted front and one side, The back of the home hasn’t seen a brush in 15 years. The lenders screwed up the industry and once again, the appraisers “PAY” both literally and figuratively for their botched and underhanded dealings with the public. This is not an appraisal problem, this is an AVM problem. The solution to the problem is not focusing on where the data is in the form or if it loads into the database. The solution is to completely eliminate the UAD and focus on the data itself and quality reports. And with the UAD we are forced to convert the appraisal to an open text document so I guess it is more important to track trends than to have secure reports. I guess it is ok to have false sense of loan security in place of being able to try to track a trend. This whole UAD is going to blow up with increased frustration on the part of the appraisers, the general public trying to understand the report (and most underwriters) along with major appraisal fraud as the bad boys and girls learn how easy it is to change the values in the report resulting more Countywide type asset failures in the future. When will these people learn? What a farce and proving adjustments is a fantasy. If one does really good research and locates strong market data, the need for many adjustments or proving a lot is not an issue. We are in an appraisal climate that supports a buisiness model and not a profession, where many need to do three appraisals a day, thus how good can the data and report be? Just specializing in a small community takes me 2 days to produce a credible SFR tract appraisal. I calculate it takes $750 for a basic home in my area to pay expenses and live. With $300 fees one would be BK if the required effort to produce quality was truly realized. There is little enforcement and from what I see and I would revoke 95% of the licenses in my state. Also, 95% of the reviewers are incompetent and so are a lot of instructors, who do not get what it is like in the field and our reality. 30 years ago appraisers cared about what they did and now it is just slam out the work. …….and that’s my ultimate grind. I’m tired of having to fight on the back end to be “allowed” to do my job correctly. Great article though! It’s important! Most of these items are symptoms, not necessarily failures by definition. They are mostly symptoms of a flawed model. I’ve no qualms with the GSE UMPD, UAD, QM, QRM or any of those blasted form filler covenants but without appraisers having the adequate working environment to fulfill those requirements, it’s mostly a futile effort. How can appraisers achieve passing 100% of the time if supporting standards aren’t in place to achieve the goal? I am fine with spending more time on each appraisal report in order to produce a better appraisal product. I already do that and will be glad to spend MORE time! However, if the fees do not increase with the increased time involved, then I will be forced to blacklist the appraisal profession that I have spent 25 years building! Sometimes there’s a simple (obvious) solution to a seemingly complex problem. Right now we waste a lot of time responding to (mis) interpretations of a host of incompetent, unqualified AMC ‘reviewers’. Then repeat the process with an AQM review. This, of course is after we run our report through our software (Alamode) ‘E&O review. If the AMC’s and GSE’s can ‘upload’ an appraisal report for an AQM Review, why not give the appraiser direct access to do the same? There’s no additional, ongoing cost involved because the AQM reviews process is already in place.Even a new, inexperienced appraiser could upload, review and revise each report as they progress, before ‘final’ submission. Thereby every report received by a GSE would be in perfect compliance. Why is it not that simple? I kept having a report rejected over and over for the “no verification of license”, no matter what I did to change things up, even though within the previous month I had submitted six other reports to the same bank without any problems. After two weeks of re-submitting the report with various “fixes”, I finally discovered it was the certification section that was not for a 1004 report, but for a land certification. Once I swapped out those two certification sections, it sailed through. I just happened to glance at the form number at the bottom of the signature page and noticed the difference. I can only assume that sometime in the past I had cloned a lot report for the same subdivision for another bank that doesn’t use UAD and just swapped out the front end as the two cert. sections look very similar. Please indicate whether or not your webinars provide appraisal CE credits. As this is my renewal year, that is crucial for determining which classes I invest time and money. We have a number of issues that lead to this problem. One of the biggest; few that sell their loans are truly invested in due diligence, only the “facade of due diligence”. So many just go to an amc and get their cheapest, fastest, number hitting flunky. As an appraiser myself, I realize that it falls at the feet of appraisers as well; so many just do not know any better or DO KNOW and don’t invest themselves in the profession. Without any real investment by the users of appraisal services as to “who” is being hired on the front end, this will continue. Nothing will change until the excuse that is “due diligence” that exists today changes; so nothing will change however, articles and white papers about how things aren’t working will continue to be pumped out. I find it amazing that anyone “in the know” is surprised given the fast, cheap and inexperience that gets hired by amcs and some lenders currently. Granted, there is never a 100% guarantee of anything, a greater percentage of success would be found if the actual professionals were put to work. Do something or do nothing but stop pretending that anything is actually getting done. The GSE’s require appraisals to pass the GSE UCDP validation requirements, but the GSE’s refuse to make the UCDP validation tool publicly available so the Appraisal User Community Members can confirm their compliance with the UCDP requirements. It’s difficult (or impossible) for the Appraisal User Community Members to pass the GSE UCDP validation requirements without access to the UCDP validation tool for testing. The GSE’s have provided access to the UCDP validation tool to GSE selected appraisal sw vendors. This has created a monopoly for the GSE selected appraisal sw vendors. The GSE’s and the GSE selected appraisal sw vendors claim the UAD/UCDP spec documents are sufficient for the remainder of the Appraisal User Community members to comply with the GSE UCDP requirements. The GSE’s selected appraisal sw vendors have already admitted they cannot comply with the GSE UCDP requirements without the GSE’s assistance and support. When the GSE’s begin blacklisting Appraisers, it will destroy the Appraiser’s career. The GSE’s must provide a public UCDP test web site available to the entire Appraisal User Community. The public test web site must contain access to the UCDP validation tool, sample appraisal reports and links to the GSE UCDP submission specification documents. Their system being screwed up has nothing to do with appraisers. I’m sure they’d like to make that our fault also, however. So, OK, how are you going to do a 442 when the client never orders the 442? Therefore, how does such have anything at all to do with the appraiser? Furthermore, many houses sell and go through a different lender before a 442 is needed, houses that were appraised for interim. Lastly, appraisers need to stop letting the lending industry make us responsible/culpable/accountable/liable for things that are completely out of our control and or have nothing to do with us. The blame game needs to stop.